Dalmore distillery is releasing a limited edition whisky to help raise funds to restore a famous Scottish castle to its former glory. Only 5,000 bottles of Dalmore Castle Leod – named after the spiritual home of the Mackenzie clan – have been produced. The whisky is finished in casks from a top Bordeaux château and has an RRP of £100. The new release follows the launch of the Dalmore Mackenzie expression last year, which raised £20,000 towards the restoration of the clan seat at Strathpeffer. Three thousand bottles of Mackenzie expression sold out across the world in less than nine months. Master blender Richard Paterson said: “Having spent its initial maturation in American white oak and Spanish sherry wood, the whisky retains the Dalmore house style of marmalade, vanilla and spice. Dalmore has a long association with the Mackenzie clan. Not only did the family once own the Highland distillery, their clan symbol – the royal stag – appears on every bottle of Dalmore along with the clan’s motto, “I shine, not burn”. 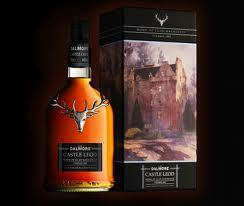 Built in 1606, Castle Leod, in the Scottish Highlands, is only 14 miles from the Dalmore distillery.